I became interested in THE MAZE RUNNER after reading Kristen’s list of books to read after finishing The Hunger Games trilogy. After reading through the whole book over a weekend, I can tell you that The Maze Runner is a great book, and I can’t wait to read the one in the series. What is The Maze Runner About? 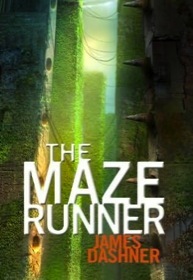 The Maze Runner was an excellent read that had me hooked from page one. Thomas’ sudden appearance in The Glade was an excellent way to keep the reader off balance and engaged in the story. While a little frustrating at first, I enjoyed how information about Thomas and the Maze was doled out in small pieces through the interactions with the Gladers. This helped create a sense of tension early on in the book, which is only heightened once the girl arrives. One of the most surprising parts of the book was how Dashner was able to lay out such detailed and vivid descriptions of the Glade and the Maze. I was able to keep a clear picture in my head of the different buildings and areas covered in the book, which gave it a good sense of realism. Giving the reader a clear picture of Thomas’ surroundings was important early on in the book, since Thomas’ whole world is basically the Glade and the Maze. Attempting to provide that kind of detail later in the book would have disrupted the flow of the story. Lastly, I liked the way that the dystopian and science fiction themes were brought out in the novel. As the reader you don’t get a very clear idea of what the world is like outside the Maze, but each new nugget of information presented in the story indicates that all is not good in the world. I got a very Lord of the Flies vibe from the Glade, which only helped enhance the feelings of dystpoia and that things could go out of control. The science fiction aspect is downplayed for the most part except for the Grievers (the monsters that patrol the Maze), which were both very scary and fascinating at the same time. I’m guessing the second book in the series, The Scorch Trials, will provide more details of what is going on outside of the Maze. The score of four stars for The Maze Runner is mainly due to it’s role as the first book in a series. While I really enjoyed the book and thought the characters were excellent, I did feel like the ending was a little sudden. I’m guessing this was to help setup the sequel, but Dashner could have let it play out a bit more before wrapping up the book. The book’s epilogue does mitigate some of the damage of the quick end to the story. I may have to reconsider my score in the future after reading the next few books in the series. Who Should Read The Maze Runner? The Maze Runner is aimed for the Young Adult audience, and it fits well within that age group or older. Readers who like dystopian or science fiction literature will enjoy the book, though don’t expect a heavy dose of either genre, just a pleasant mix. The plot is also a good match for those who enjoyed books like Lord of the Flies or any of the Hunger Games trilogy books.